A popular refrain in today’s political and socio-economic analysis has been the need for aggressive Government intervention (via taxation and regulation) to reverse growing wealth inequality. 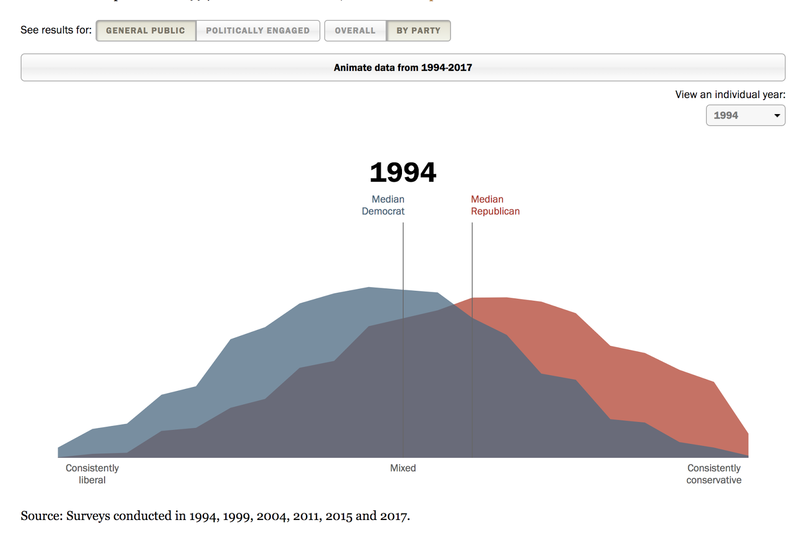 The narrative is supported by the increasing numbers of center and centre-left voters, and is firmly held in the key emerging demographic of the Millennial voters. The same narrative can also be traced to the emergence of some (not all) populist movements and political figures. Yet, through regulatory restrictions, Governments in the recent past not only attempted to manage risks, but also created a system of superficial scarcity in supply of common goods & services (healthcare, education, housing etc) and skills, as well as access to professional services markets for practitioners. This scarcity de facto redistributes income (& thus, wealth) from the poor to the rich, from those not endowed with assets to those who inherit them or acquire them through other non-productive means, e.g. marriage, corruption, force. Many licensing requirements, touted by the Governments as the means for ensuring consumer protection, delivering social good, addressing markets failures and so on are either too cumbersome (creating a de facto bounds to supply) or outright skewed in favour off the incumbents (e.g. financial services licensing restrictions in trivial areas of sales and marketing). The re-distribution takes the form of high rents (paid for basic services that are woefully undersupplied: consider the California ‘water allocations’ and local authorities dumping federal subsidies to military personnel onto private sector renters, or consider the effect of pensions subsidies to police and other public services providers that are paid for by poorer taxpayers who themselves cannot afford a pension). This benevolent-malevolent counter-balancing in Government actions has fuelled wealth inequality, not reduced it, and the voters appear to be largely oblivious to this reality. Crucially, the mechanism of this inequality expansion is not the simple r>g relationship between returns to capital (r) and the growth rate in the economy (g), but a more complex r(k)>r(hh)>r(g)>r(lh) relationship between returns to financial & restricted (r(k)), inc property & water rights in California, etc, high-quality human capital (r(hh)), inc returns to regulated (rationed) professions, the rate of growth in the economy (g), and the returns to low-quality human capital (r(lh)), inc returns to productive productive), but un-rationed professions. Why this is crucial? Because the r>g driven inequality, the type that was decried by Mr. Piketty and his supporters is missing a lot of what is happening in the labor markets and in large swathes of organisational structures, from limited partnerships to sole traders. Worse, lazy academia, across a range of second-tier institutions, has adopted Piketty’s narrative unchecked, teaching students the r vs g tale without considering the simple fact that neither r, nor g are well-defined in modern economics and require more nuanced insight. Yes, we now know that r>g, and by a fat margin (see https://www.frbsf.org/economic-research/files/wp2017-25.pdf). And, yes, that is a problem. But that is only one half off the problem, because it helps explain, in part, the 1% vs 99% wealth distribution imbalances. But it cannot explain the 10% vs 90% gap. Nor can it explain why we are witnessing the hollowing-out of the middle class, and the upper middle class. A more granular decomposition of r (and a more accurate measurement of g - another topic altogether) can help. The non-corporate entities and high human capital individual earners can still benefit from the transfers from the poorer and the middle classes, but these benefits are not carried through traditional physical and financial capital returns or corporate rent seeking. (Do not take me wrong: these are also serious problems in the structure of the modern economy). Take for example, two professionals. Astrophysicist employed in a research lab and a general medical practitioner. The two possess asymmetric human capital: astrophysicist has more of it than a general medical doctor. Not only in duration of knowledge acquisition (quantity), but also in the degree of originality of knowledge (quality). But, one’s supply of competitors is rationed by the market (astrophysics high barrier to entry is… er… the need to acquire a lot of hard-to-earn human capital, with opportunity costs sky-high), another is rationed by the licensing and education systems. Guess which one earns more? And guess which one has access to transfers from the lower earners that can be, literally, linked to punitive bankruptcy costs? So how much of the earnings of the physician (especially the premium on astrophysicist’s wage) can be explained by a license to asymmetric information (extracting rents from patients) and by restrictions on entry into profession that go beyond assurance of quality? How much of these earnings are compensation for the absurdity of immense tuition bills collected by the medical schools with their own rent-seeking markets for professional education? And so on. In a way, thus, the Governments have acted as agents for creating & sustaining wealth inequality, at the same time as they claimed to be the agents for alleviating it. Yes, consumer protecting regulation is necessary. No question. Yes, licensing is often necessary too (e.g. in the case of a physician as opposed to a physicist). But, no - transfers under Government regulations are not always linked to the delivery of real and tangible benefits of quality assurance. Take, for example, restrictive development practices and excessively costly planning bureaucracies in cities, like, San Francisco. While some regulation and some bureaucracy are necessary, a lot of it is pure transfer from renters and buyers to bureaucrats as well as investors. So, do a simple arithmetic exercise. Take $100 of income earned by a young professional. Roughly 33% of that goes in various taxes and indirect taxes to the Governments. Another 33% goes to to the landlord protected by these same Governments from paying the full cost of bankruptcy (limited liability) and from competition by restrictive new building and development rules. Another 15% goes to pay for various insurance products, again - regulated and/or required by the Governments - health, cars, renters’ etc. What’s left? Less than 20% of income puts gas into the car or pays for transportation, buys food and clothing. What exactly remains to invest in financial and real assets that earn the r(k) and alleviate wealth inequality? Nada. And if you have to pay for debt incurred in earning your r(hh) or even r(lh), you are… well… insolvent. Personal savings averaged close to 6.5-7% of disposable income in 2010-2014. Since then, these collapsed to 2.4% as of December 2017. Remember - the are percentages of the disposable income, not gross income. Is that enough to start investing in physical and/or financial capital? No. And the numbers quoted are averages, so \median savings are even lower than that. 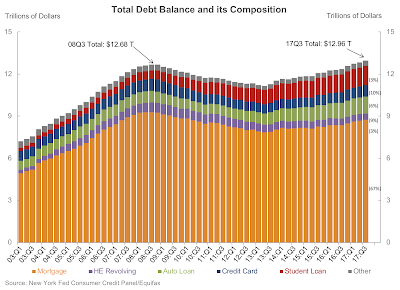 Meanwhile, regulated auto loans debt is now at $4,340 per capita, regulated credit card debt is at $2,930 per capita, and regulated student loans debt is now at $4,920 per capita. Federal regulations on credit cards debt are know n to behaviourally create barriers to consumers paying this debt down and/or using credit cards prudently. Federal regulations make student loans debt exempt from bankruptcy protection, effectively forcing borrowers who run into financial troubles into perpetual vicious cycle of debt spiralling out of control. Auto loans regulations effectively create and encourage sub-prime markets for lending. So who is responsible for the debt-driven part of wealth inequality? Why, the same Government we are begging to solve the problem it helps create. Now, add a new dimension, ignored by many followers of Mr. Piketty: today’s social & sustainability narratives risk to deliver more of the same outcome by empowering Governments to create more superficial scarcity. This does not mean that all regulations and all restrictions are intrinsically bad, just as noted before. Nor does it mean that social and environmental risks are not important concepts. Quite the opposite, it means that we need to pay more attention to regulations-induced transfers of wealth and income from the lower 90% to the upper 10% and to companies and non-profits across the entire chain of such transfers. If we want to do something about our social and environmental problems (and, yes, we do want) we need to minimise the costs of other regulations. We need to increase r(hh) and even more so, r(lh). And we need to increase the g too. What we do not need to do is increase the r(k) without raising the other returns. We also need to recognise that on the road paved with good (environmental) intentions, we are transferring vast amounts of income (and wealth) from ordinary Joe and Mary to Elon Musk and his lenders and investors. As well as to a litany of other rent-seeking enterprises and entrepreneurs. The subsidies fuel returns to physical and fixed capital, intellectual property (technological capital), financial capital, and to a lesser extent to higher quality human capital. All at the expense of general human capital. Another aspect of the over-simplified r vs g narrative is that by ignoring the existent tax codes, we are magnifying the difference between various forms of r and the g. Take the differences in tax treatment between physical, financial and human capital. Set aside the issue of tax evasion, but do include the issue of tax avoidance (legal and practiced with greater intensity the higher do your wealth levels reach). I can invest in fixed capital via a corporate structure that allows depreciation tax claws-backs and interest deductions. I can even position my investment in a tax (non-)haven jurisdiction, like, say Michigan or Wisconsin, where - if I am rich and I do invest a lot, I can get local tax breaks. I can even get a citizenship to go along with my investment, as a sweetener. Now, suppose I invest the same amount in technological capital (or, put more cogently, in Intellectual Property). Here, the world is my oyster: I can go to tax advantage nations or stay in the U.S. So my tax on these gains will be even lower than for fixed capital. Investing in financial capital is similar, with tax ranges somewhere between the two other forms of capital. Now, if I decided to invest in my human capital, my investments are not fully tax deductible (I might be able to deduct some tuition, but not living expenses or, in terms of corporate finance, operating expenses and working capital). Nor is there a depreciation claw back. There is not a tax incentive for me to do this. And my returns from this investment will be hit with all income taxes possible - state, and federal. It is almost sure as hell, my tax rate will be higher than for any form of non-human capital investment. Worse: if I borrow to invest in any form of capital other than human capital, and I run into a hard spot, I can clear the slate by declaring bankruptcy. If I did the same to invest in human capital, student loans are not subject to bankruptcy protection. Not to make a long argument any longer, but to acknowledge the depth of the tax policy problems, take another scenario. I join as a partner a start up and get shares in the company. Until I sell these shares as a co-founder, I face no tax liability. Alternatively, I join the same start up as a key employee, with human capital-related skills that the start up really, really needs to succeed. I get the same shares in the company. Under some jurisdictions rules, I face immediate tax liability, even if I can never sell these shares in the end. Why? Ah, no reason, other than pure stupidity of those writing tax codes. The net effect is the same across all of the above points: risk-adjusted after tax returns on investment in human capital are depressed - superficially - by policies. Policies, therefore, are driving wealth inequality. After-tax risk-adjusted returns to human capital are lower than after-tax risk-adjusted returns on physical, financial and technological capital. Once again, we need to increase returns to human capital without raising returns to other forms of capital. And we need to increase real rates of economic growth (what that means in the real world - as opposed to what it means in the world of Piketty-following academia is a different subject all together). And we need to get Government and regulators out of the business of transferring our income and potential wealth from us to the 1%-ers and the 10%-ers. How do we achieve this? A big question that I do not have a perfect answer to, and as far as I am aware, no one does. One thing we must consider is systemically reducing rents obtained through inheritance, rent seeking and other unproductive forms of capital acquisition. Another thing we must have is more broadly-spread allocation of financial assets linked to the productive economy (equity). In a way, we need to dramatically broaden share holding in real companies’ assets, among the 90%. Incidentally, this will go some ways in addressing the threat to the social fabric poised by automation and robotisation: making people the owners of companies puts robots at work for people. Third thing is what we do not need: we do not need is a penal system of taxation that reduces r(hh) and r(lh). Progressive income taxation delivers exactly that outcome. Fourth thing: we need to recognize that some assets derive their productivity from externalities. The best example is land, which derives most of its value from socio-economic investments made by others around the site. These externalities-related returns must be taxed as a form of unearned income/wealth. A land value tax or a site value tax can do the job. As I noted above, I do not claim to hold a solution to the problem. I do claim to hold a blue print for a systemic approach to devising such a solution. Here it is: we need sceptical, independent & continuous impact analysis of every piece of regulation, of every restriction, of every socially and environmentally impactful (positive or negative) measure. But above all, we need to be sceptical about the role of the Government, just as we have become sceptical about the capacity of the markets. Scepticism is healthy. Cheerleading is cancerous. 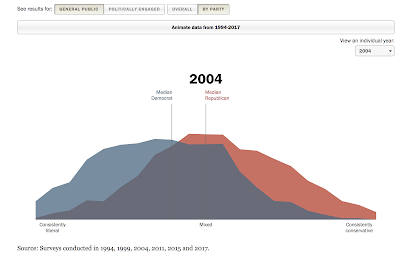 Stop cheering, start thinking deeper about the key issues around inequality. And stop begging for Government action. Government is not quite the panacea we imagine it to be. Often enough, it is a problem we beg it to solve. What's 'normal'? Pew Research data on political polarization in the U.S. (full report here http://www.people-press.org/interactives/political-polarization-1994-2017/). 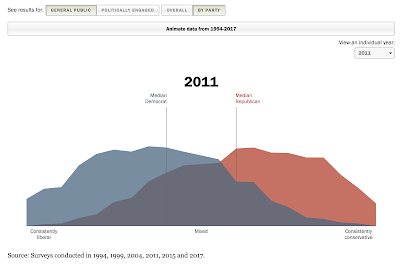 A very dramatic drift toward the tails of the original distributions for both the Republicans and the Democrats, and, associated with this, an effective collapse in the numbers of the U.S. voters in the overlapping/shared position. 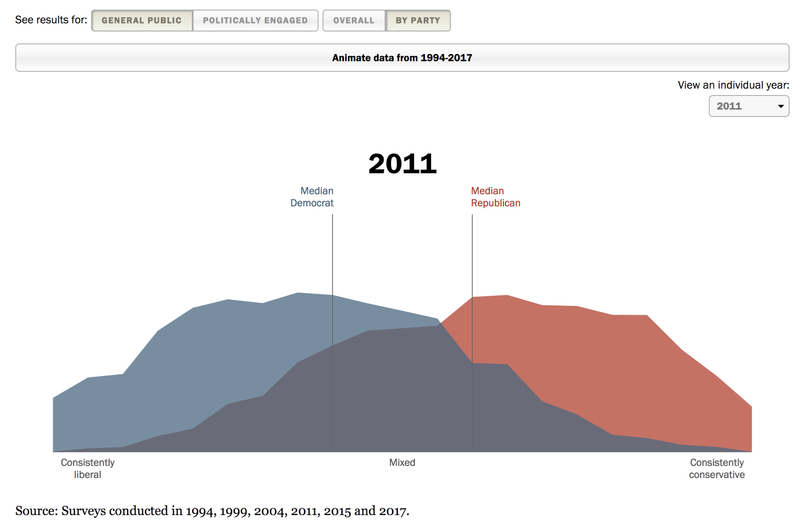 Looking at pure preferences (excluding party identification), there has been a flattening (left-skewed) of public preferences spectrum. This also is consistent with growing polatization, but it is also consistent with increasing support by the voters for Extreme-Left and Left positions. The Center worldview has diminished substantially. 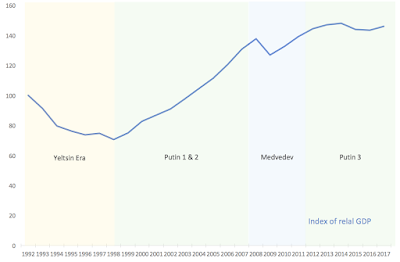 You can read my view on longer term trends and drivers for this dynamic here: https://papers.ssrn.com/sol3/papers.cfm?abstract_id=3033949. Cato released their 2017 Human Freedom Index. 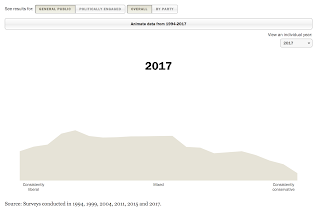 The link is here: https://object.cato.org/sites/cato.org/files/human-freedom-index-files/2017-human-freedom-index-2.pdf and all data is available here: https://www.cato.org/human-freedom-index. Ireland: the country ranks in top 5 in the overall Index, in the 4th place overall, which is unchanged on 2016 report. This compares against 3rd place ranking in 2013-2014 index. One key area of strength - Economic Freedom sub-index. 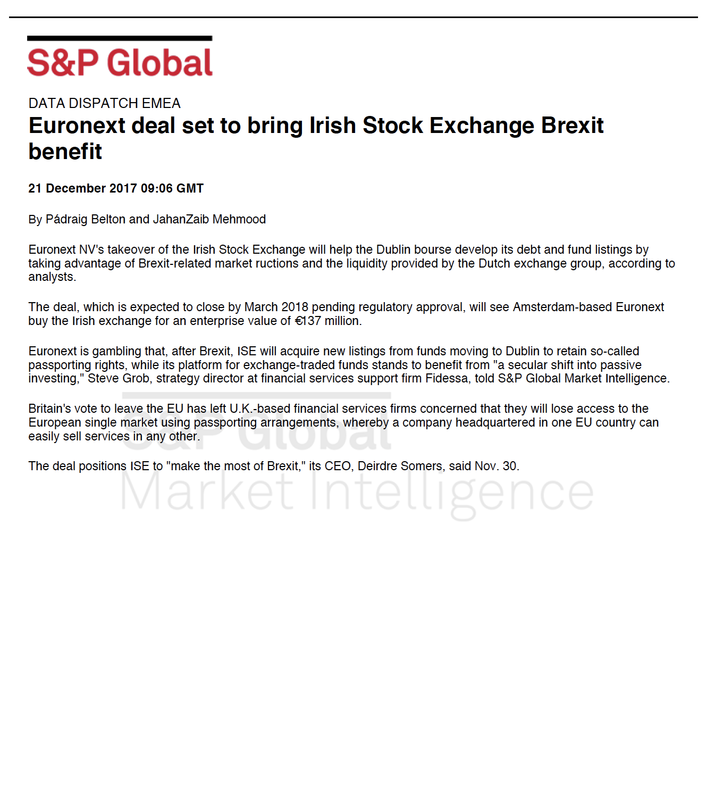 This is a problem area for the Index, which relies on GDP-based metrics and, thus, significantly overstates Irish economic performance. Aside from this, in many other areas, the index presents a correct picture of the country. The U.S.: the index consistently debunks the myth of American exceptionalism. The country is ranked lowly 17th in 2017 overall, with Personal Freedom ranking of disastrous 24th and with a respectable 11th rank in Economic Freedom. The country scores below 9.0 in overall Rule of Law grouping, in Homicide category, in overall Religious Freedom grouping, and in Laws and Reg. That Influence Media category. Sadly, there are no rankings relating to the extent of personal lives control by the 'Deep State' or security forces. Neither do Cato folks measure access to healthcare, quality of public services, education etc - the key aspects of the functional society that are clearly sub-standard in the U.S. case. Nor does the Index address the extent of bureaucratic over-reach into the lives of the residents. Were these aspects to be considered, I doubt the U.S. would be ranked anywhere near top 30. This is hardly the stuff of legends. The U.S. ranking performance is mediocre for a nation that promotes itself as a bastion of personal and economic freedoms and the leading light for liberty. Just take this last number into consideration: when it comes to rating the U.S. on freedom of movement of capital and people, Cato gave the nation a miserly score of 3.7/10. 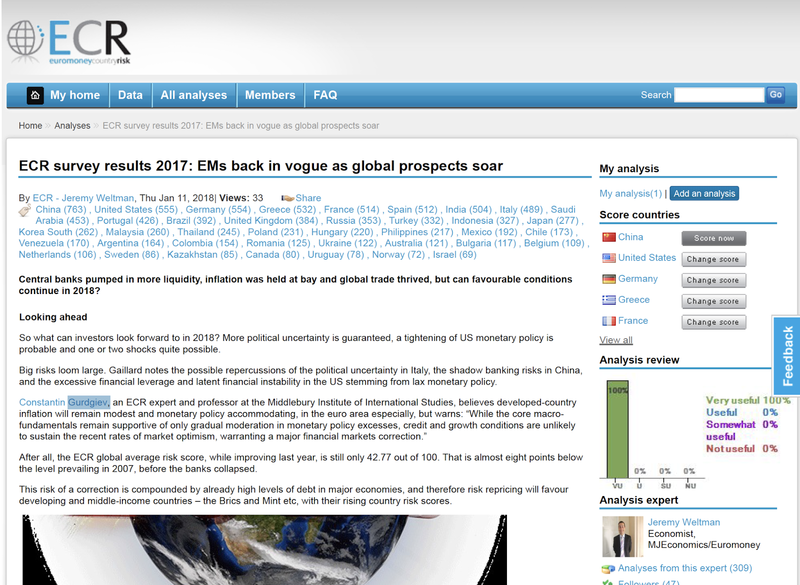 And in Freedom to Trade Internationally, the nation that claims moral leadership across the WTO, TPP, TTIP, Nafta and beyond, the 'guardian of the seas' scores 7.5/10, with sub-8.5 scores in Tariffs and Regulatory Trade Barriers categories. Irony has it, the 2017 ranking for the U.S. (at #17) is vastly better than 2016 ranking (at #24). Neither is, however, good enough. Data wrinkles aside, tiny Ireland offers more grounds for global leadership-by-example than the U.S. does. Based on data compiled by Bloomberg, 2017 was a bumper year for VC-funded startups across the U.S., with significant increase in the geographic diversification of funds flows across many states. You can see the full analysis here: https://www.bloomberg.com/graphics/2018-venture-capital-deals/. From our local, Monterey, perspective, here is the kicker: in 2017, Monterey County (with population around 415,000) was ranked below its neighbor, Santa Cruz County (with population of around 262,000) in terms of total VC-funded deals volumes. And by a significant margin lower. Of course, every cloud has a silver lining, of sorts. The one this year is that at least Monterey County managed to register on the VCs' radar. Back in 2015 it was just a blank void for start ups investment. 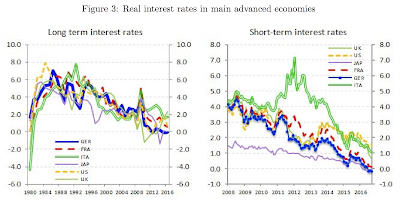 An interesting recent paper from ECB on the link between monetary policy (interest rates) and secular stagnation. Ferrero, Giuseppe and Gross, Marco and Neri, Stefano, ECB Working Paper, titled "On Secular Stagnation and Low Interest Rates: Demography Matters" (July 26, 2017, ECB WP No. 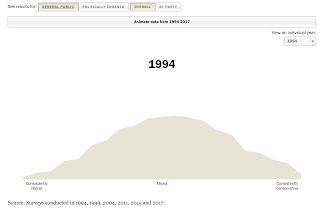 2088: https://ssrn.com/abstract=3009653) argues that adverse demographic developments can account for a long-run (since the mid-1980s) trend decline in real and nominal interest rates. In particular, demographic factors linked to secular stagnation, have "exerted downward pressures on real short- and long-term interest rates in the euro area over the past decade." 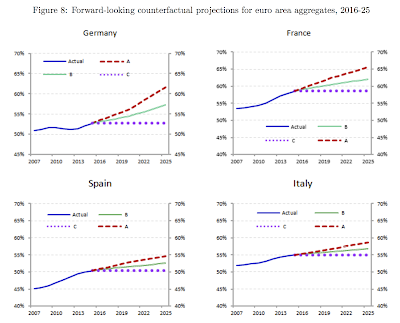 Using EU Commission projected dependency ratios to 2025, the authors "illustrate that the foreseen structural change in terms of age structure of the population may dampen economic growth and continue exerting downward pressure on real interest rates also in the future". demography. Interest rates would have been higher and economic activity growth measures stronger under the assumed more favorable historical demographic assumptions. 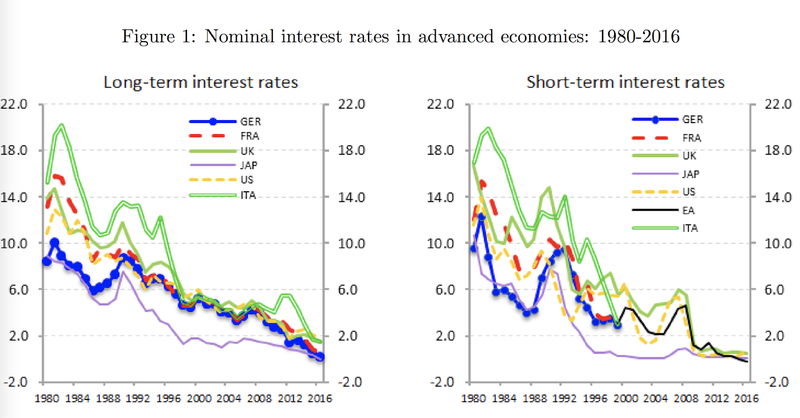 Concerning the forward-looking assessment, interest rates would remain at relatively low levels under the assumption that demography develops as projected by the EC, and would rise visibly only under the assumed more favorable forward paths for dependency ratios." 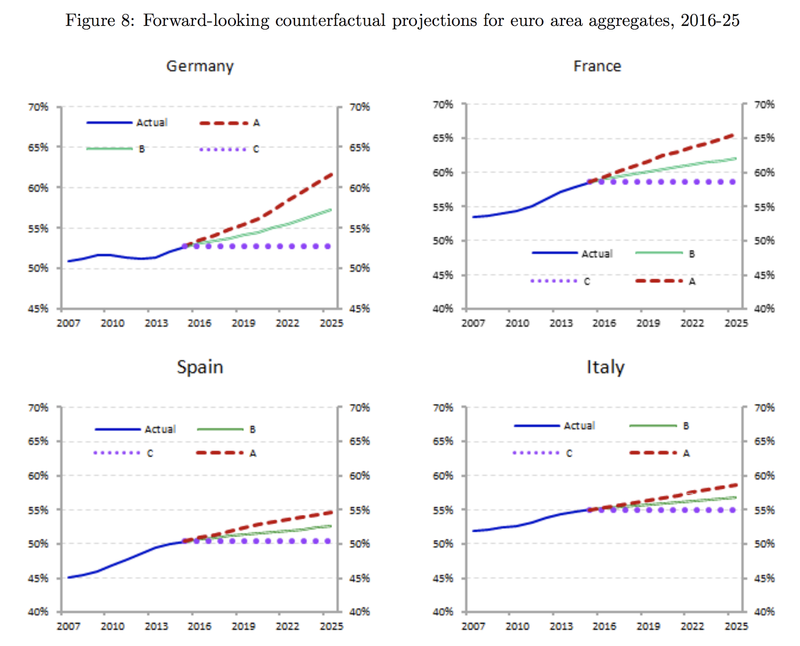 Notice the following: under both, the adverse (European Commission estimates) and the moderate (central - green) scenarios, we have real GDP growth materially below 1 percent by 2025 and on average, below historical average levels for pre-crisis period. This is secular stagnation. In fact, even under the benign scenario of no demographic change from 2015, growth rate is unimpressive. Potential output panel confirms this. 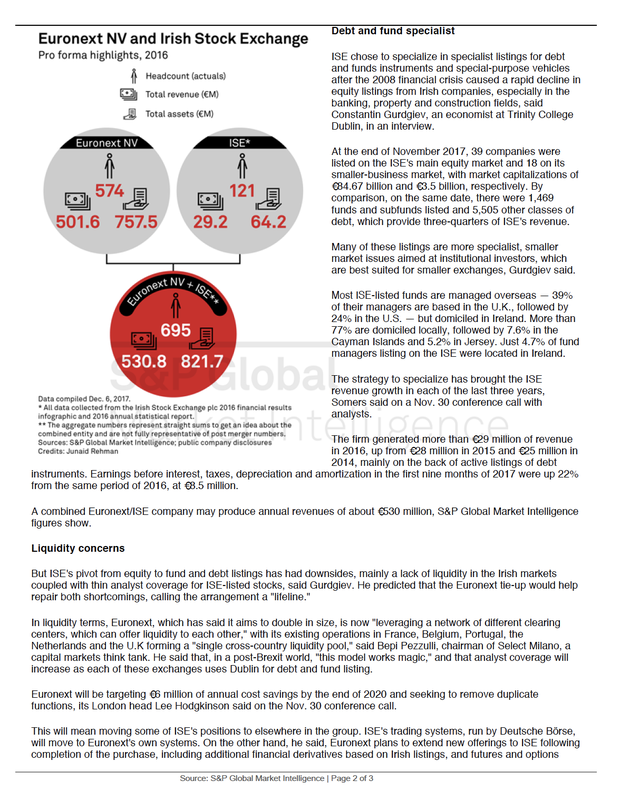 21/1/18: FT Warns on Credit Cards Delinquencies: High or Hype? The FT are reporting a 20% rise in credit cards delinquencies across major U.S. banks in 2016, compared to 2017 (see here: https://www.ft.com/content/bafdd504-fd2c-11e7-a492-2c9be7f3120a). Which sounds bad. Although, of course, neither new nor completely up-to-date. That is because the NY Fed give us the same figures (for all U.S. households) through 3Q 2017.
Credit Card delinquencies rose to 6.33% of total balances in 3Q 2017, up from 5.15% a year ago and from 5.45% in 3Q 2015. So, in fact, instead of a 20% jump, y./y for 3Q figures, there was a drop in 2016 compared to 2015, but a big jump in 2017 on 2016. One can expect a more significant jump in 2-3Q 2018, as new credit issuance glut of 4Q 2017 works its way into defaults (see link here: http://trueeconomics.blogspot.com/2018/01/19118-tears-over-qe-us-household-debt.html). 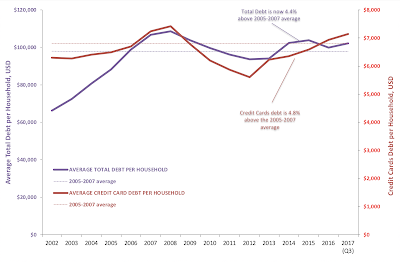 Besides this, as noted here http://trueeconomics.blogspot.com/2018/01/19118-tears-over-qe-us-household-debt.html, credit card debt is rising and rising fast, with overall debt levels now 4.8% ahead of 2005-2007 average. 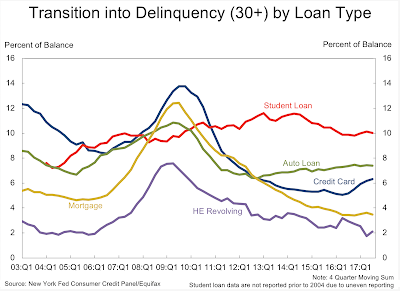 Despite these worrying dynamics, the levels of delinquencies are still low. 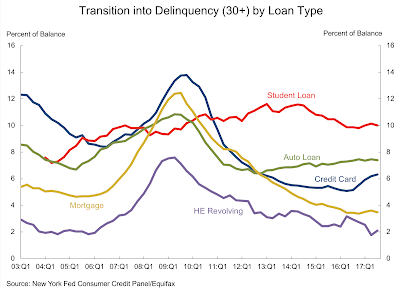 In 2007-2008, credit card delinquencies rates were around 9.34% and 10.84%, respectively. In 2006, these were 8.54%. In fact, current running average for 1Q-03Q 2017 is 6.14% or lower than for any year between 2003 and 2012. 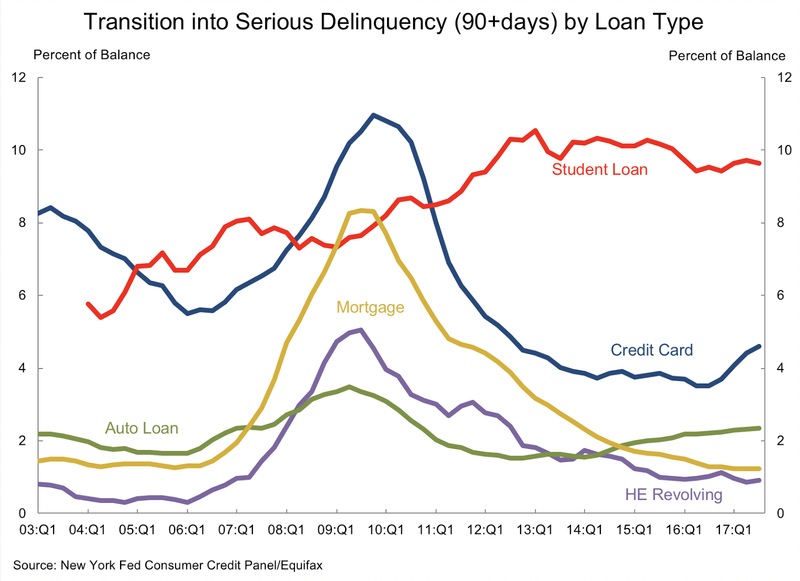 As the chart below shows, the real crisis is currently unfolding not in the credit cards debt, but in Student Loans with 10.05% average delinquency rate for 2017 so far. 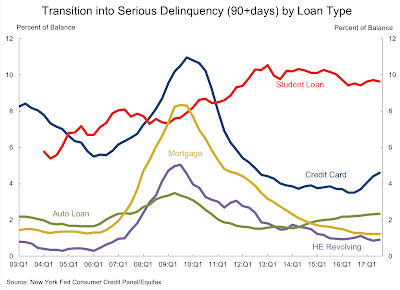 Credit crds delinquencies are only fourth in terms of severity. In terms of total volumes of debt in delinquency, 3Q 2017 data shows credit cards with USD12.3 billion, against mortgages at USD88.56 billion, student loans at USD 30.16 billion and auto loans at USD 17.05 billion. 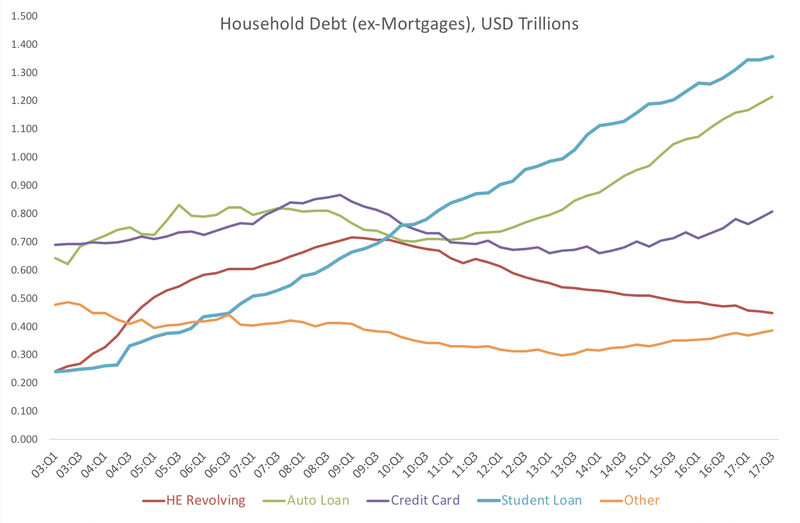 In summary, thus, the real crisis in the U.S. household debt is not (yet) in credit cards or revolving loans, and not even (yet) in mortgages. It is in student debt, followed by auto loans. 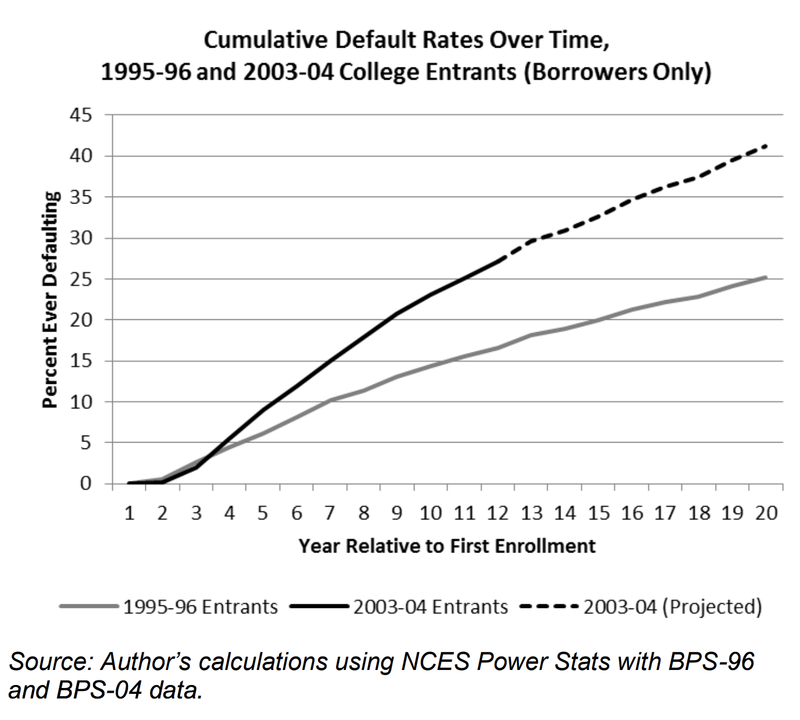 "Trends for the 1996 entry cohort show that cumulative default rates continue to rise between 12 and 20 years after initial entry. Applying these trends to the 2004 entry cohort suggests that nearly 40 percent may default on their student loans by 2023." In simple terms, even 12-20 years into the loan, default rates are rising, which means that after we take out those borrowers who are more likely to default (earlier defaulters within any given cohort), the remaining borrowers pool is not improving. This applies to the cohort of borrowers who entered the labour markets at the end/after the Recession of 2001 - a cohort that started their careers before the Global Financial Crisis and the Great Recession, and that joined the labor force at the time of rapid growth and declining unemployment. "The new data show the importance of examining outcomes for all entrants, not just borrowers, since borrowing rates differ substantially across groups and over time. 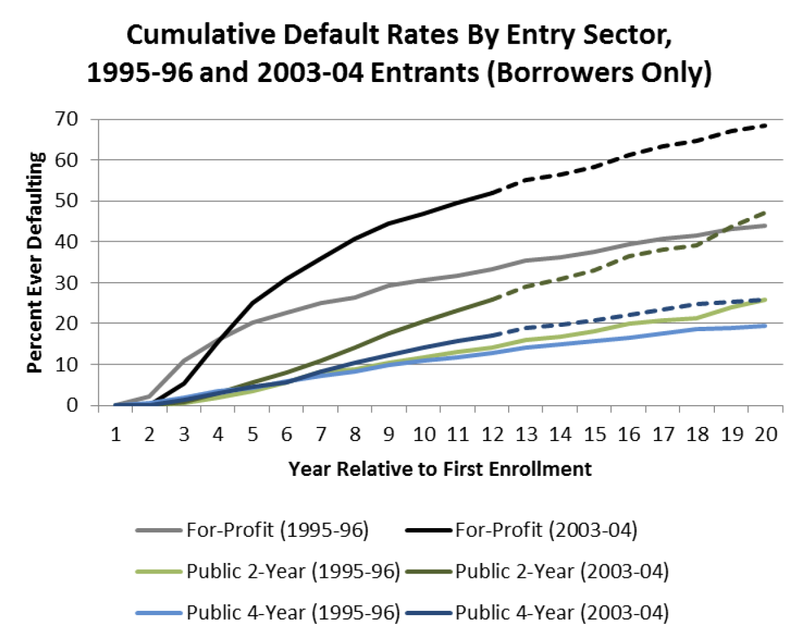 For example, for-profit borrowers default at twice the rate of public two-year borrowers (52 versus 26 percent after 12 years), but because for-profit students are more likely to borrow, the rate of default among all for-profit entrants is nearly four times that of public two-year entrants (47 percent versus 13 percent)." 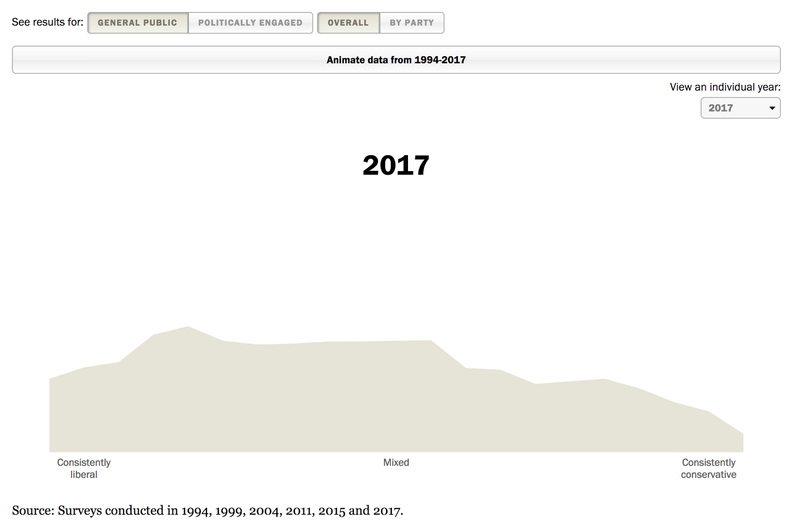 Which means that the ongoing process of deregulation of the for-profit education providers - a process heavily influenced by the Trump Administration close links to the for-profit education sector (see https://www.theatlantic.com/education/archive/2017/08/julian-schmoke-for-profit-colleges/538578/ and https://www.politico.com/story/2017/08/31/devos-trump-forprofit-college-education-242193) - is only likely to make matters worse for younger cohorts of Americans. 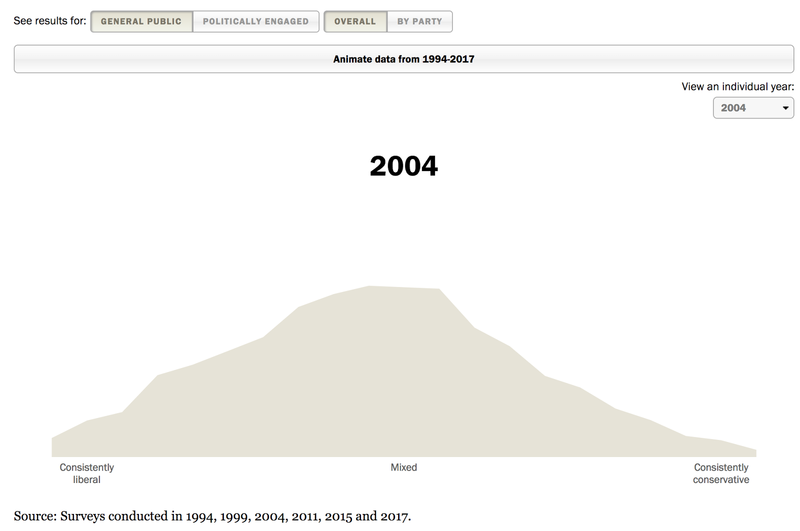 On a related: "Trends over time are most alarming among for-profit colleges; out of 100 students who ever attended a for-profit, 23 defaulted within 12 years of starting college in the 1996 cohort compared to 43 in the 2004 cohort (compared to an increase from just 8 to 11 students among entrants who never attended a for-profit)." So not only things are getting worse over time on their own, but they will be even worse given the direction of deregulation drive. 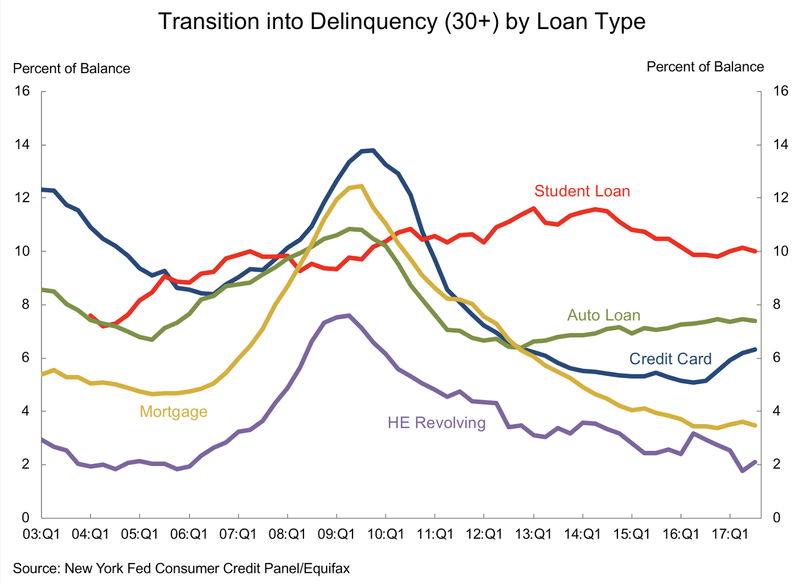 "The new data underscore that default rates depend more on student and institutional factors than on average levels of debt. For example, only 4 percent of white graduates who never attended a for-profit defaulted within 12 years of entry, compared to 67 percent of black dropouts who ever attended a for-profit. 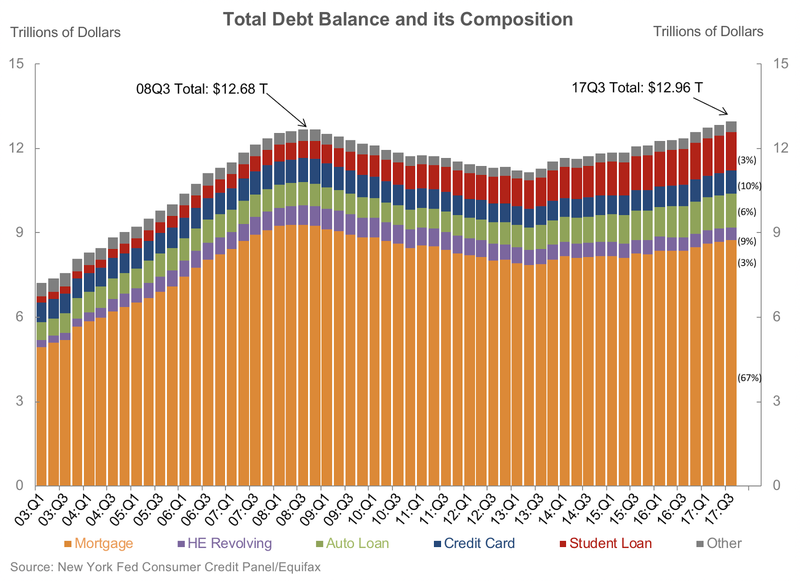 And while average debt per student has risen over time, defaults are highest among those who borrow relatively small amounts." This highlights, amongst other things, the absurd nature of the U.S. legal frameworks governing the resolution of student debt insolvency: the easier/less costly cases to resolve (lower borrowings) in insolvency are effectively exacerbated by the lack of proper bankruptcy resolution regime applying to the student loans. 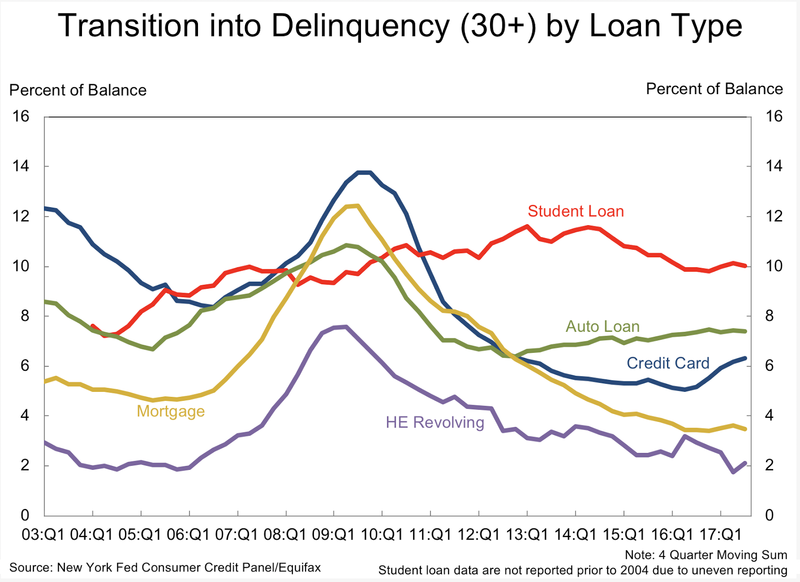 Data above clearly highlights the dramatic uplift in default rates for the more recent cohort of borrowers. 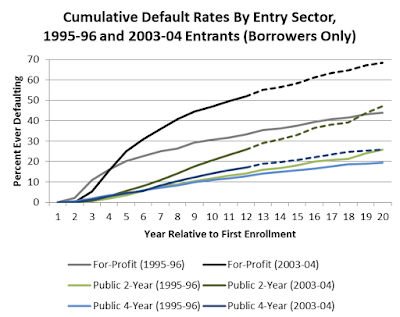 At this point in time, borrowers from the 2003-2004 cohort already exhibit higher cumulative default rates than the previous cohort exhibited over 20 years horizon. 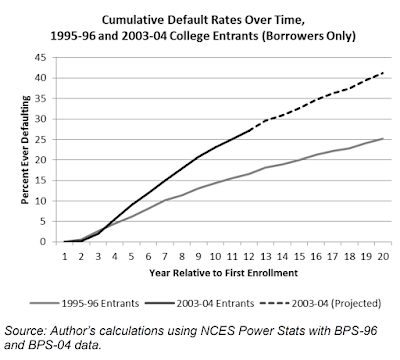 Worse, the rate of increases in default rates is still higher for the later cohort than for the earlier one. Put differently, things are not only worse, but are getting worse faster. For-profit institutions' loans default rates are now at over 50% and rising. In simple terms, this is a form of legislatively approved and supported debt slavery, folks. Which, taken together, means that the rich got richer, and the middle classes and the poor got poorer. Because debt is not wealth. Worse, the policies past have set the stage for a massive unraveling of the credit bubble to come, if the Fed were to attempt to seriously raise rates. Note: the figures below are not reflective of a reportedly massive jump in consumer credit in 4Q 2017 (see: https://www.marketwatch.com/story/consumer-credit-growth-surges-in-november-by-most-in-16-years-2018-01-08?siteid=bnbh). Year on year, 3Q 2015 growth in total household debt in the U.S. stood at 3.03%. This fell to 2.36% in 2016, before rising to 4.90% in 2017, the highest annual rate of growth for the third quarter period since Q3 2007. In current environment, a 25 bps hike in Fed rate, if fully passed through to household credit markets, will increase the cost of household credit by USD32.4 billion per annum. The same shock five years ago would have cost the U.S. household USD 28.3 billion per annum. Now, put this into perspective: current markets expectations are for three Fed rate hikes (and increasingly, the markets are factoring a fourth surprise hike) in 2018. Assuming the range of 3-4 hikes moves to raise rates by 75-100 basis points, the impact on American households of the QE 'normalization' can be estimated in the region of USD98-130 billion per annum. Since much of this will take form of the non-deductible interest payments, the Fed 'unwinding' risks wiping out the entire benefit from the recent tax cuts for the lower-to-upper-middle class segments of population. 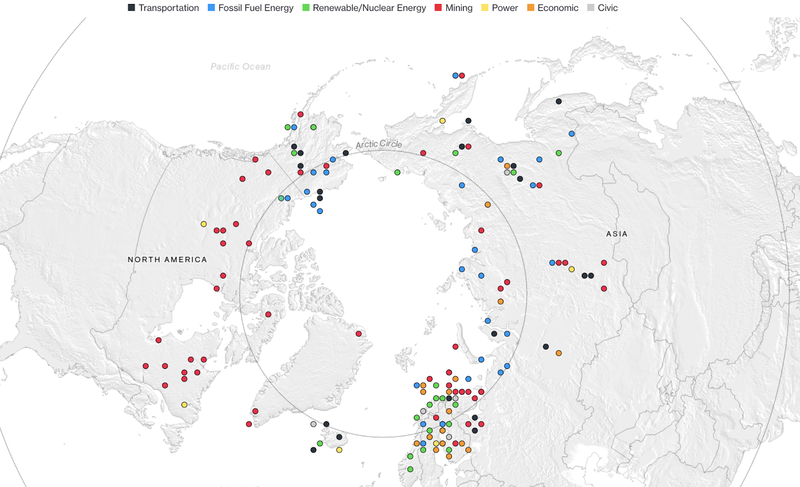 A must-read set of three in-depth articles/visualizations from Bloomberg, documenting evolution of key environmental issues relating to the Arctic over time. The first part covers the issue of the ice cap: https://www.bloomberg.com/graphics/2017-arctic/. 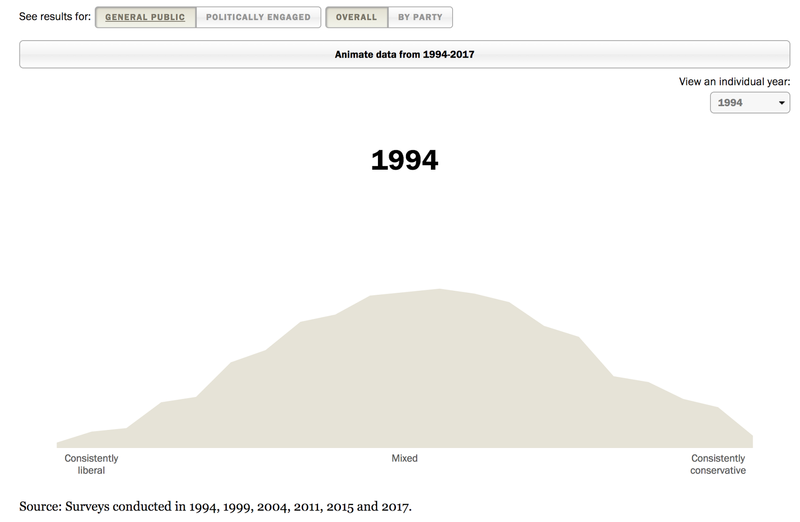 The second part details the scale of political and geopolitical issues: https://www.bloomberg.com/graphics/2017-arctic/the-political-arctic/. 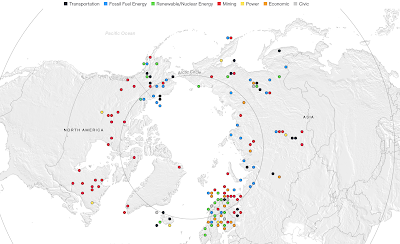 Finally, part 3 covers economics of the Arctic region https://www.bloomberg.com/graphics/2017-arctic/the-economic-arctic/. A genuinely impressive material worth reading. As an added resource, Reuters are running a dedicated page on the news and issues involving the Arctic https://www.reuters.com/places/arctic. There is a lot that can be criticized in the GOP/Trump tax reforms passed late last year, but some things do make sense. Back in November 2016, in my column for the Cayman Financial Review (see here: http://trueeconomics.blogspot.com/2016/11/31116-cfr-tax-cure-for-american.html), I argued that a comprehensive tax reform of the U.S. corporate tax system, alongside a generous repatriation scheme for off-shored profits of the U.S. MNCs can provide a significant boost to the U.S. economy. Today, we got some news confirming my assertion. Apple is planning to bring some USD350 billion back to the U.S. with a large scale investment portfolio aligned to this repatriation: https://www.cnbc.com/2018/01/17/apple-announces-350-billion-investment-20k-jobs-over-5-years.html. However, to really lock in the new investment, President Trump and the Congress need to significantly revamp the existent system of work permits, work and business visas, starting with the current H1B system. Returning financial capital back to the U.S. is but the first step on the road to increasing the U.S. economic potential. Encouraging greater mobility across employers for foreign highly skilled workers. The third step must involve regulatory reforms that remove markets, financial & contractual supports for incumbent monopolistic firms (the rent-seekers, like big telecoms, large banks, automakers, etc). Opening the sectors to genuine competition will be the only chance the U.S. has to compete with the likes of China, and increase its own potential GDP). Finally, the fourth step (partially already targeted by the recent tax reforms) must involve reducing the burden of direct and indirect taxes on the American wage earners, especially those with higher skills levels. The key here is to focus on both, direct and indirect taxation, and the latter, in my opinion, includes the cost of healthcare and pensions. Apple's announcement is the good news. And President Trump does deserve credit on this. But tax holiday alone won't fix the problem of economic sclerosis that has plagued the U.S. economy for a good part of two decades now. 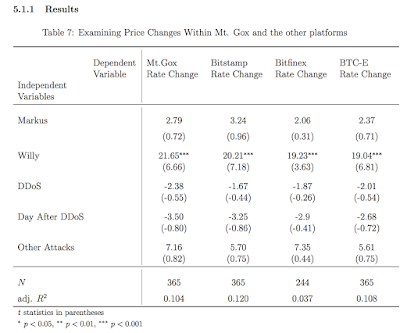 Recently, I wrote about the potential risks that concentration of Bitcoin in the hands of few holders ('whales') presents and the promising avenue for trading and investment fraud that this phenomena holds (see post here: http://trueeconomics.blogspot.com/2017/12/211217-of-taxes-and-whales-bitcoins-new.html). 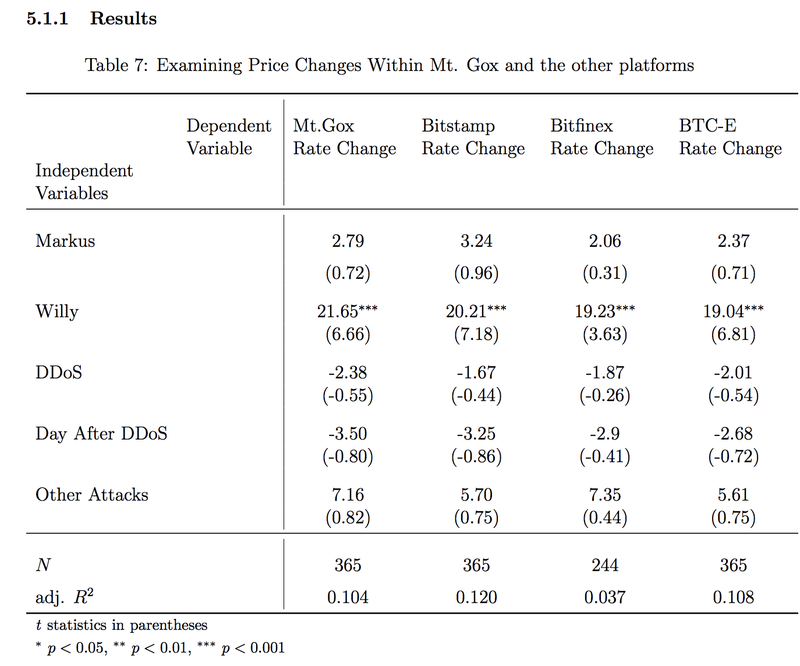 Now, some serious evidence that these risks have played out in the past to superficially inflate the price of bitcoins: a popular version here https://techcrunch.com/2018/01/15/researchers-finds-that-one-person-likely-drove-bitcoin-from-150-to-1000/, and technical paper on which this is based here (ungated version) http://weis2017.econinfosec.org/wp-content/uploads/sites/3/2017/05/WEIS_2017_paper_21.pdf. Key conclusion: "The suspicious trading activity of a single actor caused the massive spike in the USD-BTC exchange rate to rise from around $150 to over $1 000 in late 2013. The fall was even more dramatic and rapid, and it has taken more than three years for Bitcoin to match the rise prompted by fraudulent transactions." An S&P Global article on Irish Stock Exchange - Euronext merger. With quotes from myself included. Link here: https://www.snl.com/interactivex/article.aspx?KPLT=7&id=42978341. One of the key arguments relating the decline in the Millennials' support for liberal democratic values to socio-economic trends, identified in our recent paper on the subject (see Corbet, Shaen and Gurdgiev, Constantin, Millennials’ Support for Liberal Democracy Is Failing: A Deep Uncertainty Perspective (August 7, 2017): https://ssrn.com/abstract=3033949) is the argument that reduced socio-economic mobility for the younger generation Americans (and Europeans) is driving the younger voters away from favouring the liberal economic system of resources allocation. 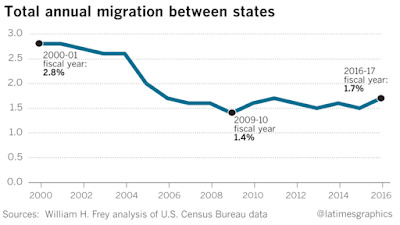 In this context, here is an interesting piece of supporting evidence, showing how the rates of physical migration across the states of the U.S. have declined in recent years - a trend that pre-dates in its origins the Great Recession: http://www.latimes.com/business/la-fi-declining-domestic-migration-20171227-story.html. On the supply side of the secular stagnation thesis, "The decline in mobility is due partly to what has become a less-dynamic and fluid American labor market, some economists believe". Note: I explain the two sides of secular stagnation theses here: http://trueeconomics.blogspot.com/2015/10/41015-secular-stagnation-and-promise-of.html. On balance, these are troubling trends. Jobs churn has been reduced - by a combination of structural changes in the American economy (e,g. rise of corporatism that reduces rates of new enterprise formation, and lack of new business investment), as well as demographic changes (including preferences shifting in favour of lower mobility). 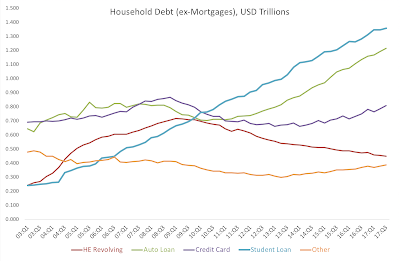 But there are also long-term cyclical factors at play, including rampant house price inflation in recent years in key urban locations, and the significant growth in debt exposures carried by the younger households (primarily due to student debt growth). There is also a structural demographic factor at work in altering the 'normal' dynamics of career advancement in the workplace: older workers are staying longer in their positions, reducing promotional opportunities available to younger workers. Finally, the rise of low-security, high-volatility types of employment (e.g. the GigEconomy) also contributes to reduced mobility. In simple terms, lower mobility is a symptom of the disease, not the cause. The real disease has been ossification of the U.S. economy and the continued rise of the status quo promoting rent-seeking corporates. Lack of dynamism on the supply side translates into lack of dynamism on the demand side, and the loop closes with a feedback effect from demand to supply. 22/1/18: For-Profit CSR: Bounds of Effectiveness? Quite an interesting paper concerning the potential limitations to the structured CSR (Corporate Social Responsibility) programs impact. Often, these days, we think of CSR-to-improve-bottom-line ideas for structuring CSR and broader Social Impact programs. In the light of this research, should we continue focusing on the bottom line-linked CSR? Traditional corporate view of CSR has been that ’we spend resources to do good’. This perception of CSR within corporations quite often results in CSR function becoming secondary to other profit-centric functions. As a response to this, academics and consultants working in the field of Social Impact have advocated for years that companies and organisations need to define CSR as an organic profit-related function. The latest research suggests that this can be counter-productive to other objectives of the CSR programs. If we do continue to focus on CSR as profit-related function in our teaching and research, what are the limitations to its effectiveness? The paper findings are based on a very restricted data set, derived from a single firm. We do not know the key factors driving the limitations uncovered in the study and we do not know how these factors translate into other geographical, cultural, social and macroeconomic contexts. Are mixed/hybrid enterprises (socially-mandated for profit enterprises) have to rely on a biased selection of employees to mitigate for this effect? In other words, are mixed/hybrid enterprises, that explicitly rely on conflating the notions of Social Impact and profitability, subject to lower productivity risks when employing ’non-prosocially-motivated’ workers? If so, are systemic biasing filters used in selecting best-fit employees for such enterprises to avoid such workers? Can these filters be identified and tested against other biases (or worse, potential discriminatory hiring practices)? As educators, we might think about structuring these questions into our classroom discussions. As researchers, we can see this study as opening up the gates for further research. The questions the study prompts are big, important and poorly researched. 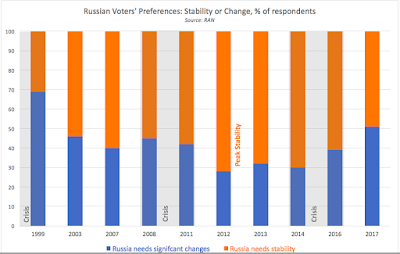 Academy of Sciences publishes relatively regular polls of public opinion that look into voters' preferences, including preferences for either "significant changes" in policy course in Russia or "stability" of the present course. Some 'Russia analysts' in the Western media have been quick to interpret these numbers as a sign of rising anti-Putin sentiment. Things are more subtle than that. There is, indeed, a rather remarkable shift in public preferences in favor of "significant changes". Which can be attributed to the younger demographic who are predominantly supportive of reforms over their preferences for "stability". This is good. However, we do not know which changes the voters would prefer. Another potential driver for this shift is the ongoing weak recovery in the Russian economy from the 2014-2016 crisis - a recovery that fades to the background voters' previous concerns with the Russian State's geopolitical standing in the international arena (key pillar of Putin's third presidency) and the movement to the forefront of economic concerns (key pillar of Medvedev's interim presidency and, so far, an apparent area of significant interest for Putin looking forward to his fourth term). These gel well with other public opinion data. 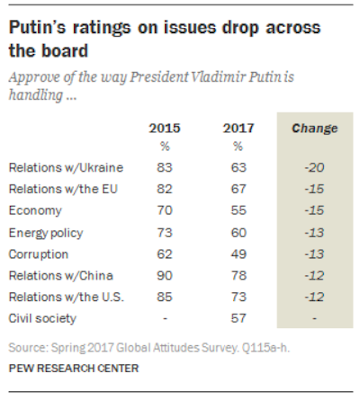 When one looks at the same polls data on core areas of domestic policy that the Russians feel more concerned about, these are: corruption (#1 priority), economy (#2 priority) and civil society (#3 priority). In other words, more liberal issues are ranked toward lower priority than other reforms (economy and corruption, which are both seen by the majority of the Russians as the domain of State power, not liberal order reforms). Civil society is an outlier to this. And an interesting one. 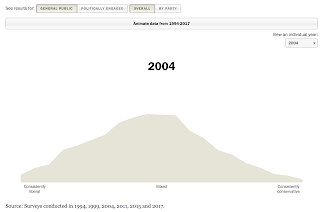 Perhaps, indicative of the aforementioned demographics shift. But, perhaps, also indicative of the dire lack of alternatives to Putin-centric political spectrum in Russia. Again, whether the voters actually see Putin as a barrier to achieving these reforms is the key unknown. Worse, not a single one area of domestic policies has plurality disapproval rating. 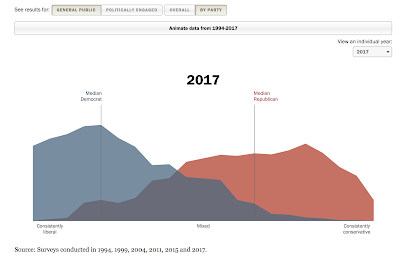 This is significant, because traditionally, Russians view Presidential office as distinct from the Government (the 'good Tzar, bad Boyars' heuristic) and the tendency to view domestic objectives as key priorities or targets for disapproval would normally be reflected in falling support for the Government, not the President. 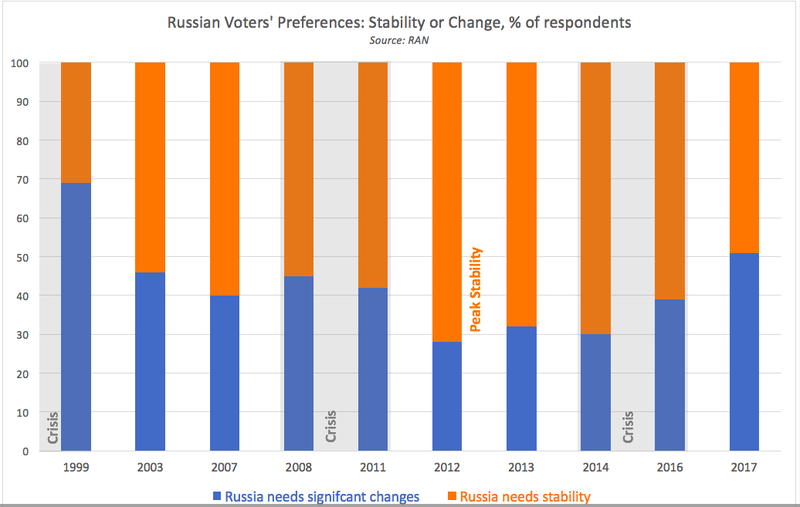 This time around, things appear to be different: Russian voters may not be blaming Putin's Presidency outright, but their confidence in the President's ability to manage the policy areas of their key concerns is deteriorating. Weakest points are: corruption and economy. And these are the toughest nuts to crack for Putin's regime because it rests strong Federalization drive of 1999-present on the foundations of balancing the interests of the rent-seekers surrounding it (aka, on corruption around it, a trade-off between loyalty to the Federal State and the President, in return for access to wealth and the ability to offshore this wealth to the likes of London, a world's capital for grey and black Russian money). Ironically, Western sanctions and broader policies toward Russia are actively constraining the scope and the feasibility of all reforms - be it reforms of the economy or civil society, anti-corruption measures or political liberalization. Note: an interesting read on the changes in the Kremlin-backing 'opposition' is also afoot, as exemplified by the new leadership emerging within the Russian Communist Party (read this well-researched and unbiased view, a rarity for WaPo, via David Filipov: https://t.co/8OfqCZzdOY). Corruption: we are likely to see public acceleration in prosecution of smaller/lower-end bureaucrats, deflecting attention from the top brass surrounding the centre. Alongside promotion of some fresh names to regional leadership posts (governors etc), already ongoing, we are also likely to see some additional consolidation of the oligarchic power in the economy. There will be no cardinal wide-spread change in power ministries and within the Deep State institutions. But, even the beginnings of such acceleration in cleaning up mid-tier of the top echelons of power will prompt hysterical comparatives to Stalin's purges in the Western media. 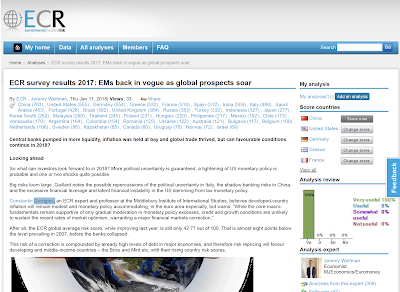 Economy: we are also likely to see a new 'Program for 2030' aiming to 'modernize' the economy, deepen capital investment, on-shore funds stashed away in Cyprus, Austria, Germany, the Baltics, the UK and elsewhere. Note, the list of Russian-preferred offshore havens - it is littered with the countries currently beating the Russophobic drums, which will make such on-shoring double-palatable for Kremlin, and more acceptable to the Russian power circles. The process of on-shoring has already began, even if only in the more public and more benign context (https://www.bloomberg.com/news/articles/2017-12-21/russia-to-issue-fx-bonds-to-help-repatriate-cash-putin-says). The Program is also likely to see some reforms of the tax code (potentially, raising 13% flat tax rate and tweaking capital gains tax regime). A deeper push can come on enforcement and compliance side, with Moscow finally attempting to shift tax enforcement away from its current, highly arbitrary and politicized, practices. 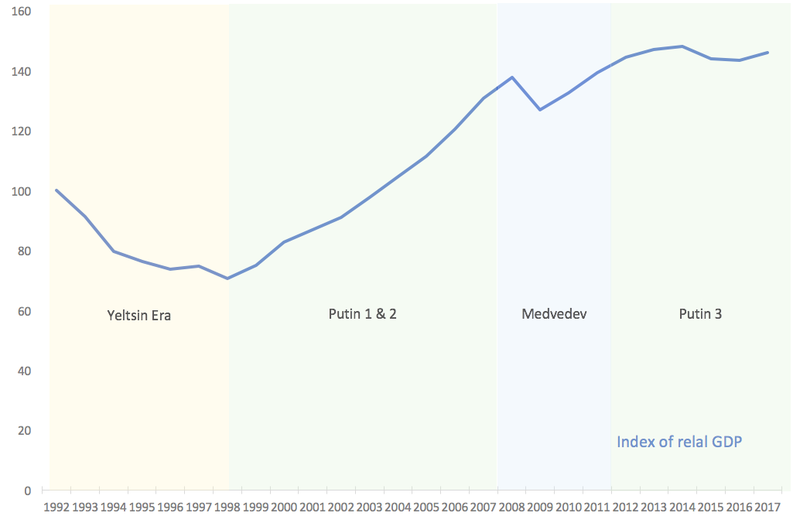 Putin is acutely aware of the fact that Russian public investment sits too low, while ammortization and depreciation are accelerating. We can expect some announcements on this front before the election, and, assuming economic growth becomes a new priority of the fourth term, an acceleration in State funding for infrastructure projects. This time around, new funding will have to flow to key public services - health and education - and not into large-scale transport projects, .e.g Crimean and Vladivostok bridges. 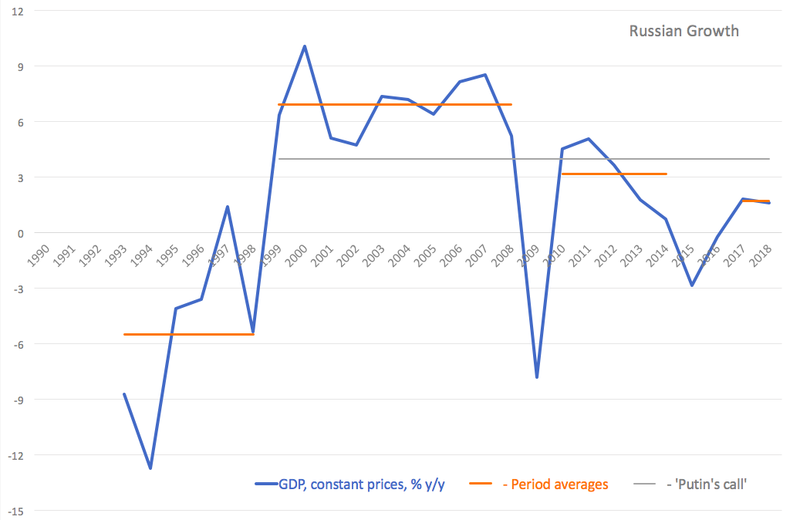 Russia is well-positioned to support these initiatives through some monetary policy accommodation, with current inflationary dynamics implying that the current 7.75% benchmark CBR rate can be lowered to around 6% mark (this process is also ongoing). 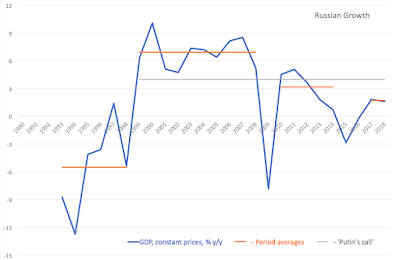 beyond fiscal and monetary aspects of reforms, Russia can opt to move more aggressively with revamping its Byzantine system of standards and certification systems to align them more closely to the best practices (in particular, those prevalent in the EU). Such alignment can support, over time, diversification of Russian exports to Europe and to other regions, where european standards effectively goldplate local ones. What we are not likely to see, in the short term, is unfortunately what is needed as much as the above reforms: changes in legal and enforcement regimes. Poor legal enforcement and outdated, politicized and often corrupt judicial system are stifling entrepreneurship, enterprise scaling, international and domestic investment and, equally importantly, development of the civil society. It also weakens the Federal State by presenting a bargain in which local loyalty to Moscow is secured by allocating local authorities power to shadow justice systems. This bargain undermines voters' trust and reduces efficiency of resources flowing across regions and from Moscow. Quarterly Manufacturing Sector PMIs for BRIC economies have once again underperformed global indicators in 4Q 2017. Global Manufacturing PMI for 4Q 2017 stood at 54.0, up on 53.0 in 3Q 2017 and marking the fastest rate of quarterly expansion in the sector on record (since 2Q 2013*). In comparison, BRIC Manufacturing quarterly PMI-based indicator stood at 51.6 in 4Q 2017, up on 51.0 in 3Q 2017. 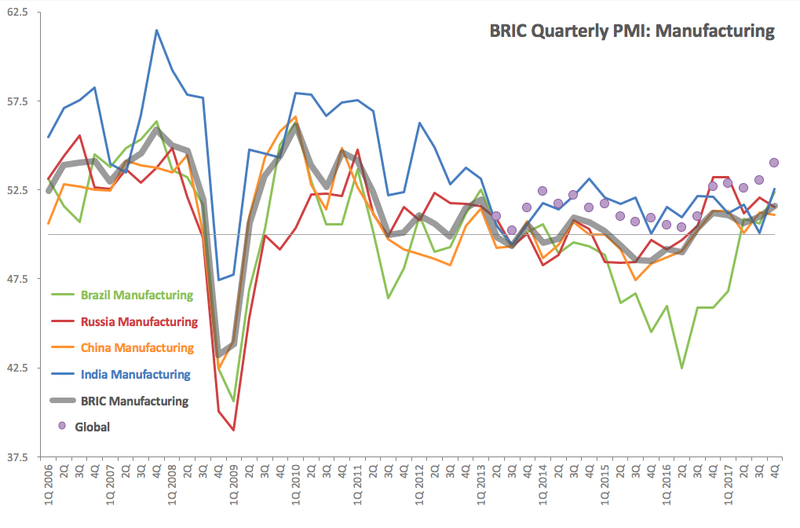 This marks the highest reading for the BRIC Manufacturing PMIs (quarterly basis) since 1Q 2013. Brazil Manufacturing Quarterly PMI measure was up at 52.4 in 4Q 2017, rising from 50.6 in 3Q 2017 and marking the third consecutive quarter of above 50.0 (nominal) readings. In statistical terms, 4Q 2017 was the first quarter with statistically significant growth signal since 1Q 2013, and marked the second fastest pace of expansion since 1Q 2011. With three consecutive quarters of above 50.0 nominal indicator readings, it is reasonable to assume that the Manufacturing sector recession of 3Q 2013-1Q 2017 is now over and the economy is moving into a new period of expansion. Russia Manufacturing q-PMI measure slipped from 52.1 in 3Q 2017 to 51.5 in 4Q 2017. Russian Manufacturing has been posting distinctly weaker PMI readings in 2Q 2017 - 4Q 2017, with sharper pace of expansion of 4Q 2016 - 1Q 2017 being replaced by rather anaemic rates of growth since the start of 2Q 2017. This stands contrasted by Services sector that currently drives Russian economic growth. China Manufacturing posted q-PMI reading of 51.1 in 4Q 2017, marginally unchanged on 51.2 in 3Q 2017. Since 3Q 2016, Chinese Manufacturing was held within the pattern of weak growth, with q-PMIs ranging from 50.1 though 51.3. In fact, last time Chinese Manufacturing q-PMI reached above 51.3 was in 1Q 2013. Judging by PMIs, Chinese manufacturing is barely growing. Which continuously puts a big question mark over both the headline GDP figures coming out of China and the PMIs. India Manufacturing qPMI jumped from 50.1 in 3Q 2017 to 52.5 in 4Q 2017, the highest rate in 12 quarters. Both Services (48.0) and Manufacturing (50.1) were very soft in 3Q 2017, and the to-date (through November 2017) reading for qPMI for Services sector (50.1) is still weak, so 4Q reading for Manufacturing qPMI is a welcome sign that things might be firming up on the growth side. 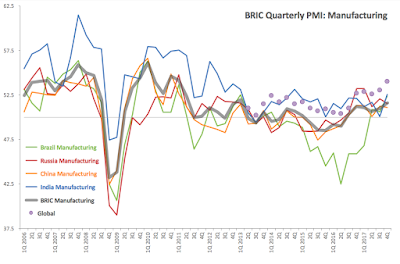 All, in, BRIC Manufacturing sector remains a weak contributor to Global growth. This weakness appears to be structural and consistent across a range of years. Dynamically, both Global and Manufacturing qPMIs are closely correlated and have been running in tandem since 2Q 2014. *Please, note: my data for this indicator - not reported by Markit, but based on market’s monthly reports - goes only to 2Q 2013. Markit have repeatedly ignored my requests for data going back before that period, despite their claim that they assist independent academic researchers in gaining access to their data. 2/1/18: Limits to Knowledge or Infinity of Complexity? Occasionally, mass media produces journalism worth reading not to extract a momentary piece of information (the news) of relevance to our world, but to remind ourselves of the questions, quests, phenomena and thoughts worth carrying with us through our conscious lives (assuming we still have these lives left). Reason 2: it posits a perfect explanation as to why truly complex, non-finite (or non-discrete) phenomena are ultimately not knowable in perfect sense. Non-discrete/non-finite phenomena belong human and social fields of inquiry (art, mathematics, philosophy, and, yes, economics, psychology, sociology etc). They are defined by the absence of the end-of-the-game rule. Chess, go, any and all games invented by us, humans, have a logical conclusion - a rule that defines the end of the game. They are discrete (in terms of ability to identify steps that sequentially lead to the end-rule realisation) and they are finite (because they always, by definition of each game, result in either a draw or a win/loss - they are bounded by the end-of-game rule). Knowledge is, well, we do not know what it is. And hence, we do not know if the end-of-game rule even exists, let alone what it might be.